In describing challenges facing the city, Probst listed “property taxes going up 10 percent each of the last three years,” as the South West Review characterized it. The 2019 numbers haven’t been finalized yet, so while they are in the 10% range (9.96%), the proposal is always a maximum and it’s usually revised downward. It would be disingenuous to talk of 2019 numbers as if they’re final. Now we should be clear: Property taxes are calculated with a complex formula using your property value compared to the property values across the city. Your property tax increases may not correspond to these numbers. Yours might go up more, or even go down. I’ve explored the complication of our property taxes before. This is the response I thought lacked a clear explanation and source, so I asked Probst for more details. Haven’t received those yet. The link he includes is to the 2018 preliminary budget, not the final budget. It’s also not clear how he gets from the preliminary $108.62 tax increase in that document to a 10% increase. It also doesn’t address the previous two years. I still rate his claim false because he hasn’t proven otherwise, and best case I’d say it’s misleading. Verdict: False. If it is approved by voters in November, approved by the state legislature, and again by the city council, it could be implemented on January 1, 2020 (14 months). While Probst is right that the sales tax, if approved by voters, may take longer to get through the state legislature (if it gets through at all), I still think his statement is wrong. In my mind, “the good side of things” is the positive scenario, and that would be Jan. 1, 2020, not two to three years. I stand by my ‘false’ claim. Probst said West St. Paul has “one of the oldest communities in the state of Minnesota,” referring to our elderly residents. Verdict: Likely false. In Probst’s defense, “one of the oldest” is a fairly vague statement, but I don’t see proof that West St. Paul is among the oldest communities in the state. We seem to be close to the average. An aging population is certainly a broader issue to consider and I’m not arguing we ignore seniors in West St. Paul. Other candidates have talked about the need to address our aging population and Probst raises a good point here. I’m just saying the rhetoric doesn’t seem to be accurate. According to MN Compass, West St. Paul is at 16.3% over 65 while Minnesota as a whole is at 15.26%. Every city I listed above as being older than West St. Paul is also older by this metric. Also note that Greater Minnesota is “greyer” than the metro. I see no proof that West St. Paul is among the oldest in the state. And let’s be clear: I support Probst’s position, I’m questioning his rhetoric. Verdict: Maybe, but the evidence isn’t there. In June, I collected responses from the 2018 candidates to the sexism controversy. Most candidates had already said something, but Jim Probst hadn’t. So I asked him for a statement. He said he was working on it and would get it to me as soon as he could. He never did. Last week, I asked Jim about several of these fact checking issues. He hasn’t responded. If you don’t communicate during your campaign and answer basic questions, then do you really believe in getting messages out? I did not directly ask Probst this question, though I did ask for his response on the sexism controversy, which he did provide. So on my second bullet above, about the sexism controversy, it took Probst four months to provide a response (he didn’t give a reason why it took so long). Probst’s response repeated a line he’s used before (that David Meisinger also repeated) about how the council will change after the election and that will help solve the problem. He says 4 of the 7 seats will change, and while that’s technically true, only 3 of the 7 people at the table will change. Regardless of who wins the mayor’s race, both Anthony Fernandez and Dave Napier will still be on the council (one will just be mayor). I didn’t bother fact checking this the first time around because it felt like too much nitpicking, but since it’s come up again I thought I might as well mention it. On my third bullet, it took him a week to respond. I guess a response that takes a while is better than no response. People are busy, I get it. But you’re running a campaign. I think it still undermines his statement that he wants to get messages out. I’ll be the first to admit that some of these are minor exaggerations. Overstating the age of West St. Paul’s population isn’t that big of a deal. The important point is addressing the needs of West St. Paul’s seniors. But exaggerating when a sales tax you’re opposed to could be implemented is a bigger deal. And giving false data about property tax increases to further your stance on taxes is straight up misleading. The communication issue also isn’t much of a fact check, more of an experience check. But it’s telling when a candidate says one thing and does another. Nobody can deny that Jim Probst loves this community and has given back in a number of ways. But that doesn’t mean we should overlook misleading political statements. He has an agenda, like everyone else, and from these examples it seems like he’s willing to misstate facts to further that agenda. 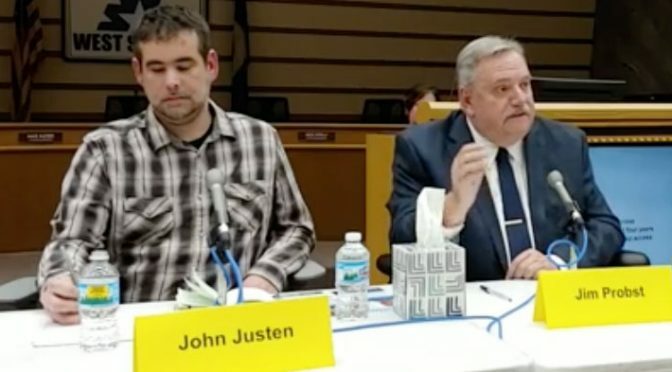 Someone might argue that this looks like a one-side fact check: I haven’t corrected any of the statements by the other candidate, John Justen. That’s true, I didn’t. Because I didn’t see any statements that seemed inaccurate. Probst could also attend council meetings to reach out to constituents which he does not. He has a lot of half truth statements. You can be a nice person but still not be council member material. I see John Justin as a more engaged person as far as serving on council. John listens and gets people involved. Hi Kevin – I respectfully disagree with you on Jim Probst. I have know Jim Probst for may years. When ever asked he has give back to this community both financially and of his time. Jim has always been the first to volunteer. I assure you Jim has no agenda other then community and helping other. I am not alone in my opinion on Jim Probst and I know if you were given the chance to really get to know him one on one I think you would agree. That said I believe Ward 2 is going to be well represented regardless of who wins. Bruce: Thanks for your comment. I never said that Probst doesn’t give back. I specifically said that he does love his community and has given back in a number of ways. Let’s be clear that I’m not questioning Probst’s dedication to West St. Paul. I also said he has an agenda, like everyone else. I have an agenda when I write this blog. You have an agenda in coming on here to defend him. I don’t mean that in a nefarious manner. We all have our own motivations. I’m saying Probst has made what I think are some misstatements, specifically about issues he champions, and that’s worth considering.